As a red head (well auburn-ish) it seems to be my lot in life to suffer from the various ills and ailments that seem to affect those with ultra fair skin; sunburn in February, eczema, generally looking as pale as a ghost, you know the score. But the one I find the most debilitating is the horrendous condition I suffer from every year - hayfever. In fact it's not just hayfever, as I've got older I seem to have become more susceptible to allergies of every sort - dust for example I find sends me into sneezing fits, itchy eyes and general misery (worst when I'm cleaning the house, a good excuse not to do it but then it gets more dusty!). Hayfever starts in around March, I don't know what sort of pollen is around at that time of year but it doesn't do me any favours. By April I can not open my eyes properly until around 10am. I have no idea why I am so badly affected in the mornings, but contact lenses seem to make the problem worse, and sunglasses slightly help. May and June are a write off and I mainly cower indoors, especially if my husband is cutting the lawn. Picnics are a no-no as is going near any sort of animal. My symptoms are always the same, ridiculously sore eyes that are mega dry and make my contact lenses pop out; really really runny nose all the time, sore throat and constant sneezing. I've tried all sorts of remedies, though when I was pregnant and couldn't take any medication at all I was particularly miserable. That year I tried eating lots of honey from local bees after being reassured by the bee keeper that this was a failsafe technique. It didn't work, and I got really bad toothache. Now I take a daily hayfever tablet, nose spray and multiple eye drops, it takes the edge off it but it doesn't seem to really hit the spot. A few times I've been to the doctors for super strong hayfever tablets but have been given the ones that make me really really sleepy, I'm knackered enough as it is without taking medication that makes me more so. 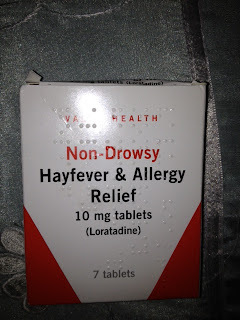 I'm a bit of an expert on the cost of hayfever medication, as a thrifty mum I'm always on the lookout for cheap hayfever tablets to stock up on. Recently I've been buying Boots value range which is 99p for seven tablets. 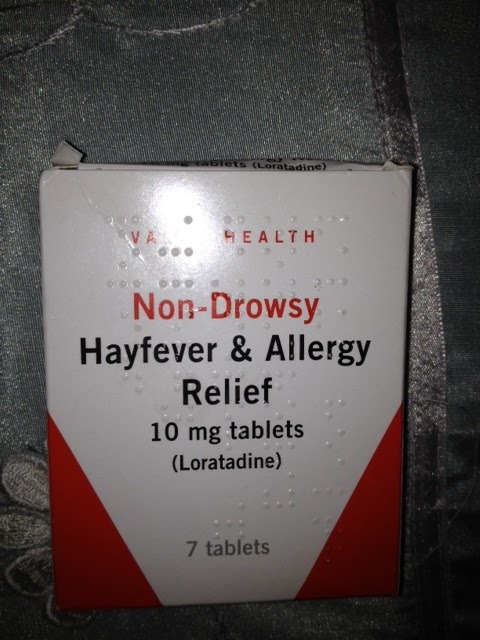 I noticed on the packet that it says they are 10mg tablets containing the ingredient Loratadine. With a bit of investigative work I noticed that this is the same ingredient that is in the coloured box, snazzy looking "Boots" branded ones which cost £4.49! For 14 rather than 7 but that still makes them double the cost! So for a nice looking box you have to pay double for exactly the same product. The Clarityn ones (which used to be my brand of choice!) are £3.39 for 7, which is more than double the cost of the value ones, even though they contain exactly the same ingredient. At the moment these are on buy one get one free which makes them better value, but still quite a lot more than the value ones. To me, this shows a lack of transparency about what you are buying and what you are getting for your money. I always thought that branded products were better quality than the "value" ranges, but in this case, if the active ingredient is the same, surely it is exactly the same product. 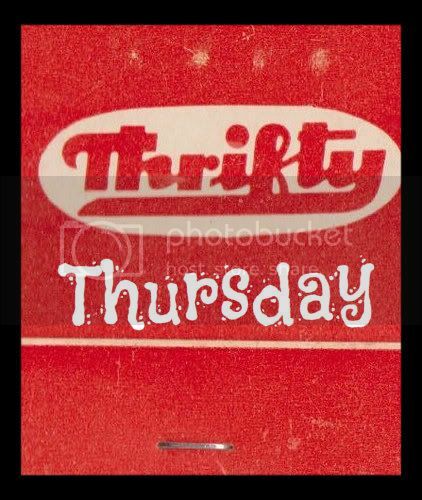 Do you have any examples of "value" ranges being exactly the same are much more expensive branded products? I've noticed that! I think the Nurofen are slightly easier to swallow perhaps, but agreed, same thing! I think with food, you are quite often paying for what you get. I used to buy value stock cubes etc til I looked at the ingredients and noticed how much salt they contain compared to oxo etc! I a with you on the hayfever hating. Several times a day I have to remove my contact lenses just in time as my eyes get uncontrollably itchy and swell up. I haven't found a thing that works and don't leave the house without sunglasses even if it is cold and wet. I think pain killers are the other main culprit and certain meat products are actually a higher percentage of meat in the value range than some of the mid-range brands! Glad I'm not the only one, though sorry for your discomfort! I'm going to have a really good look at the supermarket this week and have a good comparison of products. I tried buying brand own ketchup rather than Heinz and lived to regret it, and brand own washing powder smells funny! Working as an RN in A&E, we would always tell our patients to buy shop brand medication rather than fill a prescription for a named version. They are the same thing - like everything else you're paying for a name and the associated advertising. Check the dosage when comparing but otherwise, same drug, same effect, no difference at all. For example, 48 Zantaz 75mg tabs cost £12.15, Boots own brand of the same drug cost £4.49 or £8.98 for 48...that's nearly 4 quid difference! Your best bet (if you don't want to work it out for yourself) is to tell the pharmacist what you want and ask them for the generic (non-branded)equivalent. I buy Rinitadine (is that how you spell it?!) all the time and have been fooled by zantac a couple of times, but not anymore. It's a complete rip off isn't it! The companies know that loads of people buy it and need it so just hike the price up. I actually buy Rinitadine in Home Bargains for 89p, it's so much cheaper! Thanks for your comment, good to hear from someone qualified so I know I'm not giving out duff information! I too suffer from hayfever, badly. I always take the small one a day tablets like you, with Loratadine in them. I use the Tesco ones, which I believe are £1 for 14. I take them no matter what I feel like in the morning and I've also started taking eye drops. They worked for me last year, this year seems worse for some reason and the itchy eyes are just such an irritant! £1 for 14, what a bargain! I will go there in future. I agree that this year seems particularly bad, have no idea why. Mine is definitely worse now than when I was a child, but then I live in a much more rural area now which could account for it. You are right about the expensive tablets having a sugar coating, esp painkillers with ibuprofen in. Double the price seems a lot of money for sugar doesn't it?! But the Boots own one was the generic version and it was still double the price of the value one! Home bargains is so great for medicines, I buy rinitidine from there for my reflux problems and it's been so much cheaper. I am also a sufferer of hay fever! The office have now quit blessing me when I sneeze now! If you can bare it try dabbing a bit of Vaseline on your nose - it helps catch pollen particles.. I get seriously depressed with mine, it's amazing how common it is though! Thanks for the advice on the vaseline. When I was pregnant and couldn't take the medication, I went into Boots who were selling some sort of gel to put round the nose. When I got to the counter to buy it the shop assistant told me to put it back and just use vaseline at a fraction of the price! I did try it and it worked I seem to remember, good tip! Sponsored Video – Organix Goodies! A chicken pox tinged "what I do all day". Win Win Win! Lovely Palmers Cocoa Butter Goodies! Having children helped my career! £125,000 beach hut for sale? Anyone?